Way back in 2010 I set up a quick little wrapper around siege for testing Magento stores and for the last nearly 2 years I’ve added features such as multiple data centers, premium subscriptions, monitoring alerts, and automated host comparisons. In this blog post I’ll walk you through an update on the new features and improvements to MageSpeedTest.com over the last few months. I’m really happy with the site and how it helps users identify and improve Magento performance. I often see test results coming through in the order of 2-3 transactions per second and >5s per transaction. Identifying these sort of slow stores early is important – customers are simply not going to wait at least 5 seconds to see a product page these days. At the opposite end of the performance spectrum I see public tests coming through with incredible performance profiles. For these developers and server admins it’s a way to consistently test server tweaks and tuning to get the absolute best customer experience. In this post I wanted to quickly cover my latest Magento Speed Test changes. It’s a big update because I haven’t posted anything in a while. For more information on these items, please read on. When I first started Magento Speed Test it was just a lone Amazon EC2 server. Now it’s up to 10 servers all around the globe, with testing from Europe, North and South America, 2 countries in Asia and even Australia. Heard of Australia, but can’t quite put your finger on where? Let me refresh your memory. For sites selling internationally it’s important to understand how your site performs for international visitors, and identifying if your current host can serve your international traffic adequately. Also thanks to M.D.G IT for the Australian hosting, I had a hard time finding an Aussie webhost who didn’t think I was a scammer! I recently launched the Magento Speed Test extension on Magento Connect and GitHub. This extension makes it easy to set up your sitemap.xml and run your first basic test. if configured, it will import the monitoring data from the REST API (more on that next) to give you a summary of your store performance right within your Magento dashboard. The extension guides you through creating a sitemap.xml file. 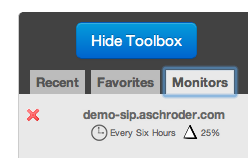 You can view your latest monitoring results from within the Magento dashboard. In addition to running one-off tests on your store, you could already configure frequent monitoring for your Magento stores – to check for the kind of gradual performance issues that can arise as hosts and developers make changes to your site and hardware. 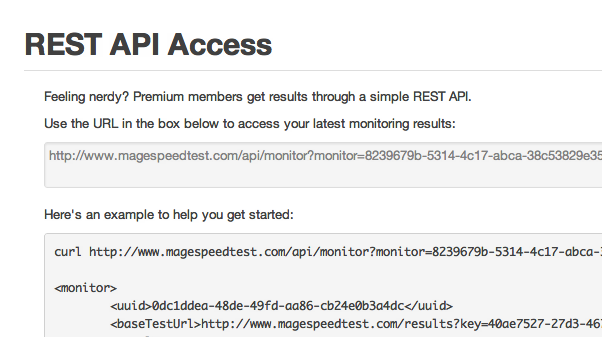 This new premium API allows you to access that monitoring data from a simple XML API. I use the API in the Magento Extension, but you may like to import the data into other places too – such as Geckboard? If you use the API, please let me know how – I’d love to share interesting uses. On the Monitor page you can see a table of your recent results, and for premium subscribers, if you scroll down you’ll see the new REST API section. This section has the secure URL you use to access the API, and also an example of the output you can expect. To access the API, you can just use curl like this. I’ve been trialling the new $9/month price for the last 6 weeks and it seems to be acceptable to users, most people tend to sign up only for a month or two during site development and testing only, others stay signed up and monitor their stores continually. Either way it’s good value for all the data centers you can access and testing and monitoring that you can do. Existing customers (thanks for the support!) will continue on their old price unchanged. I’m trialling a new feature where a Magento host can be featured for a month, this will highlight them in the hosting results table and more interestingly, compare their hosting results to user’s own results on the results page. If they are significantly faster than your current hosting, you’re invited to check out their hosting offering. I really had to wrestle with the ethics on this one, but I think it’s a valuable service both for people with really slow hosting, and for Magento hosts who might like to promote their offering (and how much better it could be) to relevant Magento users. Crucial have kindly partnered with me as I trial the service and nut out any issues on the recommendation side of things. If you run a Magento hosting company and would like to be a featured host one month, please contact me for pricing and availability. And yes, I realize it makes me a sell out. This has been a long time coming, sorry! Finally get around to recompiling the siege engine with SSL support on all the hosts, you can now test SSL capacity on your servers (and maybe offload to a loadbalancer if it’s a bottle neck for you?). Wow, if you made it this far you’re now right up to date on the news for Magento Speed Test! As a reward the first 3 new users to contact me after reading this note, can get free premium access for the remainder of 2012. Thanks! If you have any questions or feedback on the service, it’s always 100% appreciated. An Open Twitter-like Network, Powered by Email. Good on ya Ash – awesome work! Sweet. The best just got better. We’re just in the process of upgrading our site to 1.7 and trying to implement tips & techniques I’ve learnt over the past couple of years and improve our magento site. Any chance I’m in the first three responses. Great post! We’re actually the company that developed the rig for the results you so kindly described as “public tests coming through with incredible performance profiles”. That’s for a client of ours, coastalscents.com. The site was on one of the clients on the “compare hosts” which to protect the innocent we won’t name, but wasn’t delivering the speed or power they needed for their very large sales so they came to us. The site is now is live on that rig, tuned to a much higher level. Notice the longest transaction and shorts & average time have all gone down dramatically on the test I ran today: http://www.magespeedtest.com/results?key=f710c375-546f-4112-b721-5c7d9ff695ca . This is using an acceleration framework we developed in-house, and it uses only 3 (cloud) servers. If you (or anyone else for that matter) is interested in how we did it, we’d be happy to chat about it. Aschleu, first of all, congratulations for all your work. They’re all amazing, without exception. But I assume I come here to ask for another kind of help. From zero to something really annoying, my magento (1.5.1.0) store began associating wrong download link files for each and every new order. I’m really lost and don’t know what to do. It is really strange, since the store didn’t pass any major changes since the last correct order, in which all files are available correctly. I thank you very much in advance for your kindnesse and attention and hope you could help or assist me in anyway. Keep up the good work. You surely are one of the greatest Magento talents I’ve ever come accross on the web. Ashley, first of all, congratulations for all your work. They’re all amazing, without exception.